India’s very own Chinatown will soon be on the Kolkata tourism circuit, officially. The civic body has joined hands with some Tangra residents to come up with an "alley tourism" scheme that will take tourists 300 years back — to the days when the first Chinese immigrants settled in the city. It will begin with an authentic Chinese breakfast at Tiretta Bazar, followed by a visit to the eight Chinese temples, churches and museums. Tourists will be taken to the tomb at Achipur where the first Chinese colony was established, then the temples at Anandanagar and the cemetery at Beliaghata. The Chinese monastery will be a must-see. The daylong tour will terminate with a sumptuous dinner at a Chinese restaurant in Tangra. 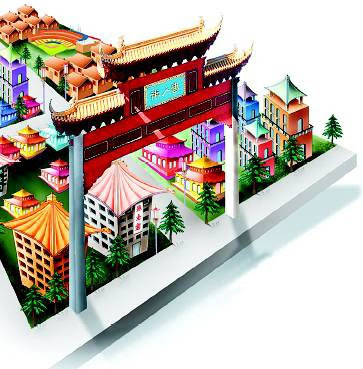 There are plans to build a full-fledged Chinese cultural centre inside Tiretta bazaar. "We have asked the government to identify a site for this," said president of Indo-Chinese Association, Paul Chung. Municipal commissioner Alapan Bandopadhyay said KMC would extend its assistance from the heritage funds. "I have asked the association to submit a blueprint. There is a friendly atmosphere developing between India and China. A Lucite policy is on the cards. After many years the city has got a Chinese consulate and Kolkata is now linked to China through direct flights. In the Buddhist Circuit Kolkata has been selected as the base before reaching Bodh Gaya. This is the time to focus on overseas Indian Chinese legacy." "Churches, Chinese clubs and old-age homes in Tangra take priority among the institutions that need to be revived and preserved," said Chung. The association also wants to revive the Nanking restaurant and the temple that houses it. "If we can get back the property we will set up a Chinese museum at Nanking temple," said Chung. The cultural centre will have an exhibition hall, an auditorium for Chinese cultural programmes, another for Chinese movies, a conference room, classes to teach dialects like Mandarin, Cantonese, Chinese and Hakka. Tourists — or even local people — who are interested in making Chinese handicrafts and artifacts can learn the traditional skills here. The association will submit a blueprint to Kolkata Municipal Corporation. Residents are ordering a statue of Chinese poet Lu Hsun from his birthplace in Shaoxint city. There will be Chinese nameplates and signages for Sun Yet Xen and Lu Hsen Streets will be redone in Chinese language. "We will create a complete Chinese environment. A China Gate will be built at the entrance to Tiretta Bazaar. We want KMC to allow the bazaar to be open in the evening too, in the name of Sun Yet Xen," Chung said. "The Chinese community will meet next Thursday to finalize the blueprint and hand it to KMC commissioner," said Chung.